There's a huge range of car hire companies operating at Queenstown Airport. Big-name international companies like Avis and Hertz are trusted and familiar, but there are also independent local brands, many offering very competitive prices. The good news is that you'll find them all here. 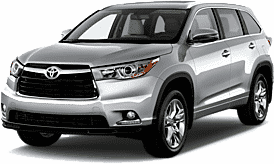 For great deals on car hire in Queenstown it’s hard to beat MatesRates. We have the sharpest prices around. And to maximise your savings it's a good idea to book your car early, especially for travel during peak periods. Just put your travel details into the Quote box at the top of the page to instantly compare a huge choice of vehicles at the very best prices. If you're arriving on an international flight you'll find the rental car counters for on-airport operators located next to the arrivals area on the ground floor. Domestic travellers can find on-airport rental car operators on the ground-floor of the multi-level car park building, directly opposite the domestic terminal forecourt. Depending on the time of the year, you'll find up to 30 different car rental brands here. Queenstown is known as the Adventure Capital of the World, thanks to its numerous opportunities for extreme activities like skydiving, bungy jumping and whitewater rafting. Even if you’re not an adrenaline junkie, Queenstown is a tourism paradise with its picture perfect scenery, pulsing nightlife and superb restaurants. Having a rental car in Queenstown gives you the freedom to explore this gorgeous part of the world, plus go further afield to magic place like Milford Sound. When you're driving in this part of the world you need to be particularly vigilant. The roads are steeper, narrower and more winding than you probably expect... plus you might encounter sheep or cattle on roads in rural areas. Many people come to Queenstown for the winter sports. But being an alpine region, you need to be prepared for driving in snow and on icey roads in the winter months. Before your journey always plan ahead and check the weather and road conditions. If you’re hiring a car during winter, consider renting a 4WD vehicle as they are best suited to alpine conditions. Queenstown is a top visitor destination all year around, but there’s something magical about this alpine town in winter. It is internationally known for great snowboarding and skiing. All levels of experience are well catered for, and the season is one of the longest around, running from June all the way through to October. Winter kicks off with a bang during the Queenstown Winter Festival, complete with dog derby and drag races. There’s live music, fireworks and a lively party atmosphere as people come out to celebrate. A total of four ski fields are within easy reach of Queenstown, none more than an hour and a half away, each with their own unique character. The closest ski field to Queenstown itself is Coronet Peak, only 20 minutes away. Coronet Peak is the only place where you can ski at night (on weekends). It has lots of diverse terrain and a robust snowmaking system. Then there’s the Remarkables, boasting sunny slopes and outstanding facilities for beginners along with chutes, bowls and a few different terrain parks. The views from the Remarkables are truly something to admire, too. A little further afield, Cardrona is an hour from Queenstown and Treble Cone slightly beyond that. Keen to up the ante? Why not give heli skiing a go and head up into the most pristine and untouched peaks you’ll ever see. You could also try snow shoeing or take a snowmobile for a blast. Pick from single day passes to unlimited season access, which can be obtained from ski shops in town. Ski stores also handle the booking of equipment, transfers and lessons and are open until 9am. If you’re driving up the mountains yourselves, ensure you know how to fit snow chains on to your rental car. Lake Wanaka enjoys a beautiful setting below majestic mountains, and is a veritable playground for outdoor enthusiasts. The lake itself covers nearly 200 square km - there’s plenty to go around among sailors, kayakers, wind surfers, paddle boarders and jet boaters and it’s never too crowded. Unsurprisingly, the fishing is superb - the lakes, rivers and streams in the area are fertile and there’s plenty of rainbow and brown trout for fly fishers. Off the water, there are great opportunities for hiking, climbing and canyoning. Nearby Mt Aspiring National Park is full of amazing landscapes and sights, hiking trails and glaciers, lakes and valleys. Aviation is also a bit of a specialty in Wanaka. The Warbirds and Wheels museum is devoted to aircraft and automobiles, and every other year the Warbirds over Wanaka air show puts on a visual spectacle. Skydiving over Wanaka is always stunning, while a number of operators offer flightseeing tours over the surrounding regions - Mt Aspiring, Milford Sound, etc. Wanaka swells in winter time as visitors flock to the slopes for skiing and snowboarding. The snow at Cardrona and Treble Cone is second to none. You can also go heli skiing or cross country skiing in the back country of Wanaka. The local theatre, Cinema Paradiso, is very cosy and embodies the epitome of southern hospitality. Or simply sit at a lakefront cafe and gaze out over the still, crystal clear waters. Wanaka is about a one hour drive from Queenstown. If you want to stay longer, Wanaka is a great place to linger. Accommodation options range from holiday parks and B&Bs to luxury lodges. When in Queenstown don’t miss a trip over to the charming settlement of Arrowtown - approximately a 20 minute drive from Queenstown. This one time gold mining town is full of history; it sprung up during the heady heights of the Otago gold rush in the mid 19th century. Over 60 original buildings remain - hotels, chapels, shops and houses. The Chinese settlement on the banks of the Arrow River is a highlight, with many restored buildings harking back to the gold ages. After the gold era petered out, Arrowtown’s fortunes started to fade. 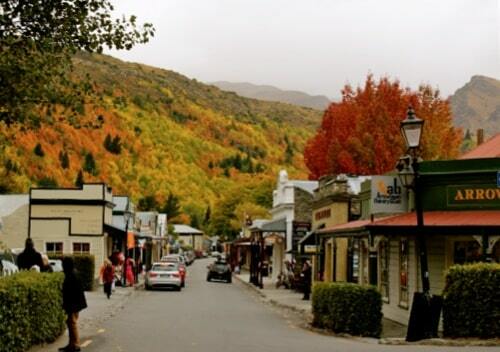 It then gained popularity again as a holiday destination and today tourism is the main draw of Arrowtown. There are quaint shops and cafes, along with the Lakes District Museum on Buckingham Street, which offers an insight into the early pioneering days and life in the Southern Lakes area. But you can still pan for gold in Arrowtown, if you wish! Try your luck in the Arrow River. Several outlets hire out gold pans and take you through the process - one even has a panning trough so you don’t need to get your feet wet. Otherwise, there are lots of lovely walks and hikes to tackle, and it’s easy to cycle around nearby. The local golf course is highly rated. Arrowtown is located in the Arrow basin, which was once carved by enormous glaciers. The area enjoys four distinct seasons and this is evident as the colours of the tranquil tree lined streets change. The scenery in autumn is rather stunning. At the end of April a festival is held to mark the seasonal change. Queenstown is known for a great many things, and increasingly, golf is one of them. Tucked away in the basin of Lake Wakatipu surrounded by picture perfect alps, Queenstown’s golf courses provide a stupendously scenic experience for visiting golfers. Little surprise then that Queenstown is the home of the New Zealand Open, an annual golfing tournament held every March. If you’re coming from out of town, you might not realise that there are half a dozen individual golf courses all within half an hour from central Queenstown. Ranging from nine holes through to 18 hole championship courses, there is something to cater for everyone. One of the most picturesque golf courses of all is at Over the Top, a par 3 course at an altitude of 1.5 km. It’s a truly unique and extreme experience. Surrounded by a back drop of tussocked hills and towering mountains, breathing in the pure fresh air, you’ll be hard pressed to match it. Now instead of simply hitting balls off the mountain, players can attempt a hole in one, off one of four tee boxes. Eco balls are used to preserve the environment. Access is by helicopter only. Golfers are flown in, and after playing their hole, are flown back out again. The flights are a scenic experience in themselves - whether taking an exclusive ride or sharing with others, be sure to savour every moment. Pair a trip to Over the Top with a package visit to one of Queenstown’s other renowned golf courses - Millbrook, The Hills or Jack’s Point - for a golfing holiday that you will always remember.